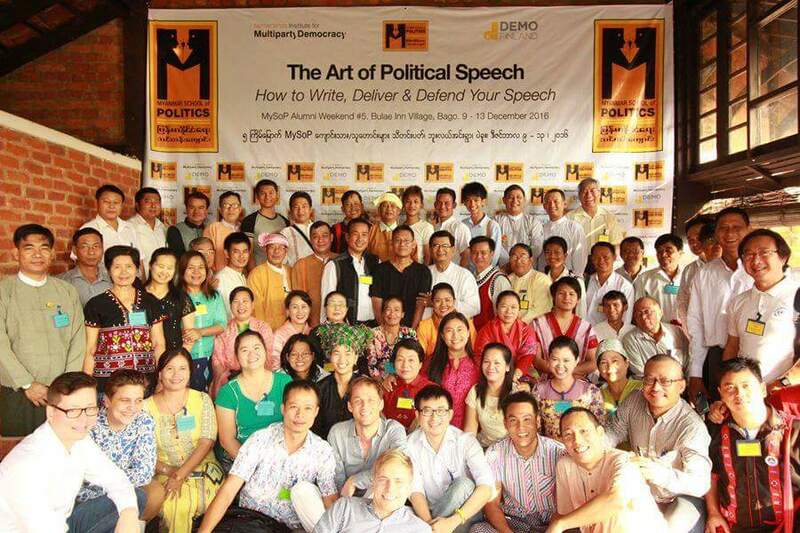 On 9-13 December 2016, alumni from the Myanmar School of Politics (MySoP) came together for an alumni event, titled ‘The Art of Political Speech’, in Bago, Myanmar. 56 alumni from 22 different political parties attended the event, where they participated in three different workshops: one on speechwriting, one on the importance of art and poetry, and one on debate skills. The first workshop focused on speech writing, where participants learned both how to write and deliver political speeches. This workshop was facilitated by Finnish MP Silvia Modig. In the second workshop, Khin Aung Aye, a well-known poet from Myanmar, talked to the alumni about the important role that art and poetry can play in political writing and speech. In the third workshop, Thin Win Htut, a popular TV presenter and moderator from the Democratic Voice of Burma, gave a practical lesson on debating skills. In this last workshop, participants were divided into groups and were assigned different topics, such as healthcare, education, and employment. They then had to debate on a certain issue, with their individual topics in mind. MySoP’s Programme Coordinator, Kyaw Zay Ya, called the event a ‘fantastic’ experience and was proud to report that many attendees felt more self-confident as a result of this event. They found their experience especially valuable with the by-elections coming up in April 2017 in Myanmar. The Myanmar School of Politics is a joint programme of NIMD and Demo Finland. Maaike van der Werf, NIMD’s Programme Manager for Myanmar, explains, “the School focuses on strengthening the democratic role of politicians and political parties, as well as enhancing the practice of multiparty dialogue. These bi-annual alumni events will undoubtedly enhance democratic practice as part of the MySoP programme”. The increasing number of MySoP students, with currently 116 alumni from 28 different political parties, is a great sign of increasing cooperation amongst political parties. As Kyaw Zay Ya says, “the MySoP family is growing”.